If you are someone who has been a regular on the blog, you will know, that my daughter enjoys our eating out experiments. So familiar has she become with cuisines, she is now quite specific about what she wants when we are out. Thin crust Margherita pizzas are high on the cards for her each time. But as a mother, all that flour and processed ingredients that go into commercially made pizzas frighten me quite a bit. Added to the fact that we are a family with a strong legacy in terms of diabetes, I have always looked for better alternatives. One thing I have always liked to do is try and replicate dishes that our family has liked when eating out, at home. This means I have better control over what I use and still manage to give them the feeling of eating a restaurant style dish. The pizza was one of the first experiments I worked on. Of course, I used wheat flour for a healthier touch and Aashirvaad has always been a go to brand. Till I got my hands on their Sugar Release Control (SRC) Atta. A term diabetics often hear in relation to their diets is maintaining one with a low Glycemic Index or GI. This is a scale that ranks carbohydrates by how much it raises blood glucose levels in the body. A low GI diet leads to healthy metabolism and weight management both of which effectively helps to manage blood sugar. Anything that is ranked 55 or below is considered good and anything 70 and above is high. Protein or fibre rich foods which have a low GI have a steady and sustained release of sugar in the body. Using wheat flour therefore that has a low GI helps in managing diabetes. 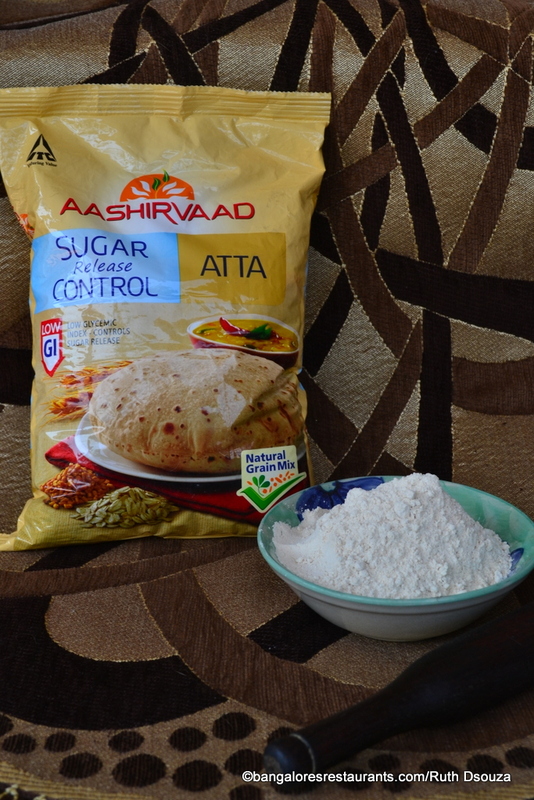 Due to its unique "Natural Grain Mix"; the blend of Aashirvaad's whole wheat flour and pulse/legume flours ensures that this Atta is high in protein and fibre with a low GI of 53. I was skeptical about the rotis I make being as good in terms of taste, but I found that there was hardly any noticeable difference. Which made me adventurous enough to try making a pizza from it too. Once the yeast is activated, mix in the salt and the olive oil. Use this as a base and add in the flour bit by bit and combine to make a firm dough. Once you have the base mixture pulling together in your mixing bowl, set it aside. Dust your platform with some all-purpose flour and tip your dough onto this. Knead the dough till all the flour is well absorbed and the dough becomes a nice, smooth ball. Oil a bowl with a bit of olive oil, place the dough in it. Turn the dough around to coat all parts of it with oil. Cover it with a cloth loosely and allow it to sit for an hour in a warm place. The dough will rise. This is what a nicely risen dough is going to look like an hour later. It would be best if you place your dough in a warm space for it to rise. In winters, place it above your oven, which has been preheated for a short while. Now while you are waiting for your dough to rise, preheat your oven at around 180 degrees centigrade. In your deep baking tray, place the roughly chopped tomatoes and spread themout. Throw in the cloves of garlic, sprinkle with salt, pepper and a generous drizzle of olive oil. Put this into your oven and roast for around half an hour. I have a fan option in my oven and used this as well. Once done, pull out your tray and roughly pulse together all the contents in a mixer. You will have your base margerita sauce ready to go. Once your dough has risen, pull out a ball of dough, of approximately 1.5 chapatis worth. Dust your platform and roll out this dough into a circle, till it is nice and flat. Pick up this circle and apply it to a pizza pan of 11" diameter that has been well oiled. 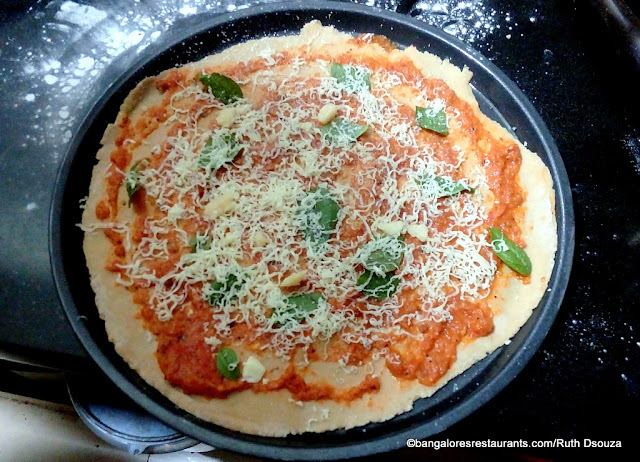 Add a generous ladle full of your margherita sauce and spread it evenly across the circle. If you are using a mix of cheeses, add on a mix of grated cheeses to your liking. Throw on a few basil leaves. Preheat your oven to 200 degrees celsius and then pop in the pan for 15 minutes or till the cheese has melted. Once done, pull the pan out of the oven and sprinkle with dry pizza seasoning. Cut out slices and serve up! The pizza ready to be popped into the oven - there is a certain joy of having an uneven sized pizza with awkward edges. Its hand made, rolled out and served, making it immensely enjoyable, especially since you can put on just about anything you like on this base. And the best part, its so good for a healthy indulgence.